Betty and I have been involved in a lot of screenings of BRAVO! and one of the salient things I have noticed is how each event is unique. It could be location, audience, weather, technical equipment…whether in the cozy confines of a friend’s home or the superb facilities at George Lucas’ Skywalker Sound. 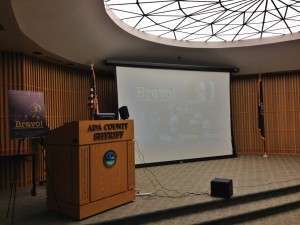 A week ago last Wednesday evening we screened the film in a different venue at the Ada County Sheriff’s Department in Boise in what has been called a “sneak preview” for folks interested in helping with the screening of BRAVO! at Boise’s Egyptian Theatre on March 30, 2015. The Egyptian is an institution in Boise and a beloved community treasure that screens films, hosts concerts and visiting authors among other events. This March 30 event is a benefit for the Ada County Veterans’ Treatment Court and the Idaho Veterans’ Network. In excess of fifty folks showed up for the sneak preview of BRAVO! last Wednesday and to engage in a discussion with organizers Norma Jaeger, Christina Iverson and BRAVO! co-producer Betty Rodgers about how they can help promote the screening which will occur on Welcome Home Vietnam Veterans Day. We heard many worthwhile ideas and received big-hearted offers of support. Inside the Ada County Sheriff’s Department prior to the screening of BRAVO! We were joined by Mike Shipman, our graphic designer and a stout supporter of BRAVO!. 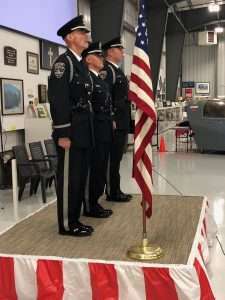 Boise’s chief of police, Mike Masterson, was there and Heather Paredes who, along with her sister, founded the Eagle, Idaho, Field of Honor. Rick Ardinger, executive director of the Idaho Humanities Council, and Mary DeWalt, director of the Ada Community Library, also came and offered their ideas. In addition to helping with the screening, the Idaho Humanities Council and the Ada Community Library plan to bring author Richard Currey to Idaho as part of Boise’s 2015 Read Me Treasure Valley program. Currey penned the novel Fatal Light about the Vietnam War. Terry Shotkoski of the Cloverdale Cemetery also attended the sneak preview. Terry is partly responsible for the Living Wall coming to Boise last September. He and his organization are BIG supporters of veterans. 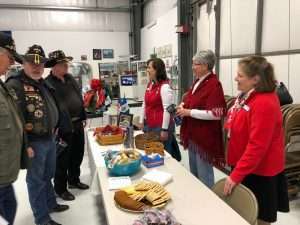 We were also joined by folks from the sheriff’s department, the Idaho Retired Law Enforcement Association, two retired generals, and John and Heather Taylor (John is BRAVO! Marine Ken Korkow’s cousin). Folks from the Boise Rescue Mission and from the Vet Center came to see how they can help, along with other great friends of BRAVO!. 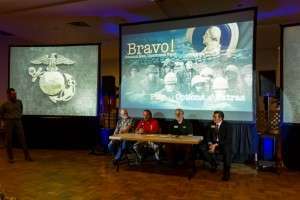 Besides the screening in Boise, BRAVO! will also be featured at related benefit events in Twin Falls, Caldwell, Pocatello and Lewiston, Idaho. We are very pleased to announce that the notable Idaho author and fan of BRAVO!, Mr. Alan Heathcock, will preside as the event’s master of ceremonies. 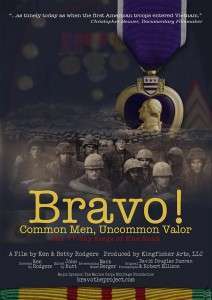 Also coming to Boise for the March 30 screening will be some of the BRAVO! 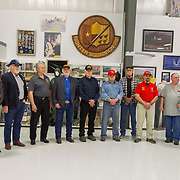 team, as well as several other Idaho authors who have written books about the Vietnam War. Come meet them all! 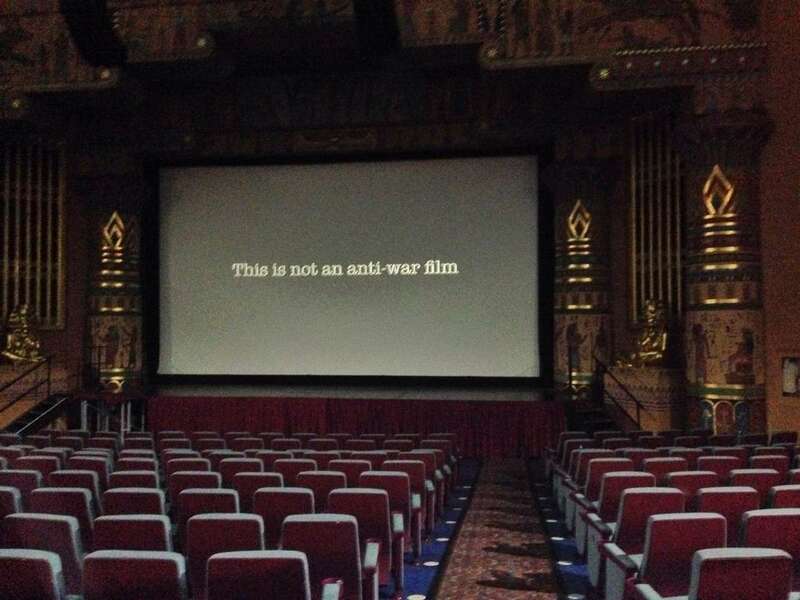 Inside Boise’s Egyptian Theater at a technical check. We are excited about this big event and how we can help folks learn more about the Vietnam War, the personal stories of the people who served, and its long-term costs in human terms. We are also excited to be able to work with all these great Idaho folks and organizations to be able to benefit the Ada County Veteran’s Treatment Court and the Idaho Veterans’ Network. Also on the screening front, mark your calendars for a fundraising screening in Casa Grande, Arizona, on February 15, 2015, at the historic Paramount Theatre. Doors open at Noon, lunch served at 1:00 PM, screening of BRAVO! to follow. We will give you more details about this screening as they become available. Last Thursday evening, 9/25/2014, BRAVO! was screened to an enthusiastic crowd of more than one-hundred folks at the Nampa, Idaho, Elks Lodge as a fundraiser for the Wyakin Warrior Foundation. The audience included ROTC cadets from Boise State University and Northern Nazarene University, veterans of multiple wars, long-standing friends of BRAVO!, and folks from the general public. BRAVO! 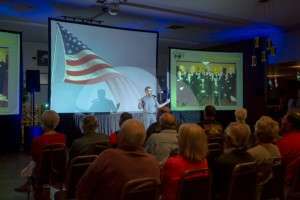 Marine Ron Rees, whose interview for the film was nothing short of electrifying, traveled with his family from Cove, Oregon, to be on a Q & A panel that included Iraq War veteran George Nickel and Vietnam Vet and United States Army chopper pilot Cliff Gaston who pulled two tours in Vietnam. BRAVO! co-producer and co-director Ken Rodgers rounded out the panel. Al Heathcock speaking to the audience. The event was expertly emceed by Boise-based author Alan Heathcock, whose short story collection, VOLT, is an outstanding look at the agony and ecstasy of being human. VOLT has won many prestigious literary awards.You can find out more about Al at http://alanheathcock.com. Joining Alan on the program was Wyakin Warrior Foundation co-founder and board president Jeff Bacon. Jeff is a cartoonist whose work is published widely, and you can read more about his work at http://blogs.militarytimes.com/broadside/about/. 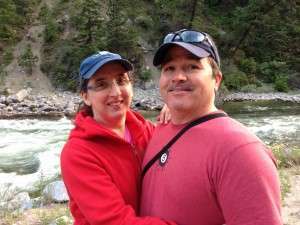 You can also learn more about the Wyakin Warrior Foundation and their important mission at http://www.wyakin.org/. Panel discussion following the screening of BRAVO!. Left to right: Ken Rodgers, Ron Rees, Cliff Gaston, George Nickel. Events like this don’t just happen and we are very proud to shoot an energetic OORAH! to Mr. Ed Willson, the Exalted Ruler of Elks Lodge #1389, Mr. Lawrence Manning and Betty Mallorca of Hill Street Studios/Track 13, Whiskey River Bar and Restaurant, business development professional Mr. Jeff Foster, Thorne Printing and Copy Center of Nampa, and International Minute Press of Boise. We extend special thanks to Tom Frazee and Nancy Roché of Admagination for the spectacular audio/visual set-up and to Mike and Monique Shipman of Blue Planet Photography for organizing the entire shebang. Mike Shipman is the graphic designer for BRAVO! You can find out more about Admagination at http://www.admaginationstudios.com/622013_ad/and Blue Planet Photography at https://www.blueplanetphoto.com/. 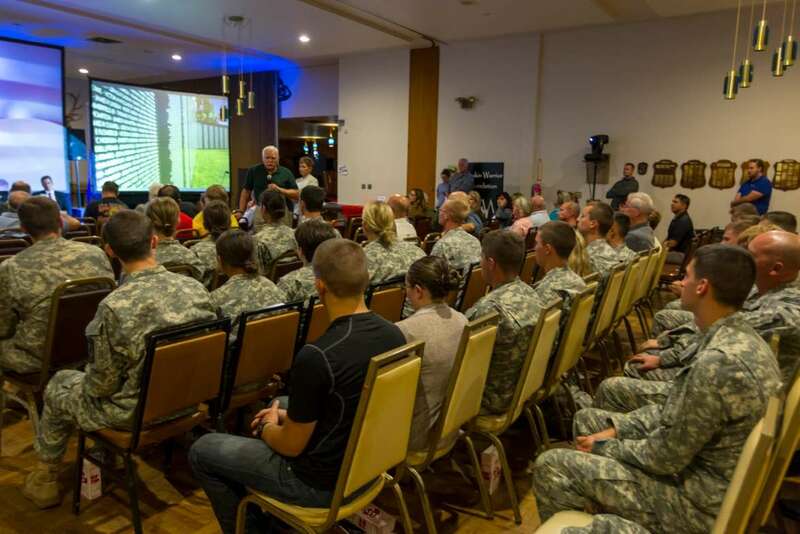 A member of the audience addressing the ROTC cadets at the screening of BRAVO! We made a lot of new friends for BRAVO! at this event, and we cherish every single new relationship as we drive onward in our quest to have every American see this film. More of the new friends we gained at the Nampa screening are the staff at Wyakin Warriors Academy headed by Roy Ledesma. Roy was instrumental in rounding up the bulk of the crowd for the screening. Thank you, Roy! We look forward to upcoming screenings at the Meridian Library in Meridian, Idaho, on October 22; Oceanside, CA, on November 1; and Newport Beach, CA, on November 15, 2014. Please join us and invite your friends. BRAVO! 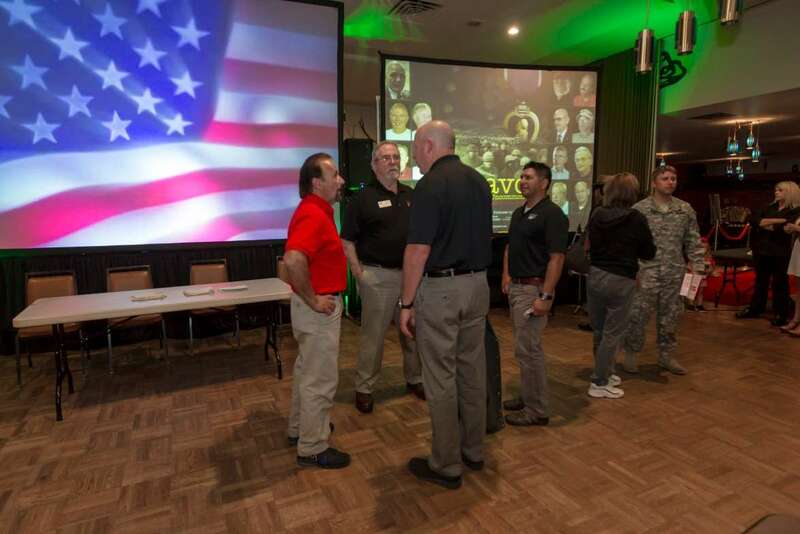 Marine Ron Rees, left, speaking to volunteer members of the Wyakin Warrior Foundation. If you would like to host a screening of BRAVO! in your town this winter or spring, please contact us immediately. DVDs of BRAVO! are available. For more information, go to https://bravotheproject.com/buy-the-dvd/. BRAVO! has a page on Facebook. Please “like” us and “share” the page at https://www.facebook.com/Bravotheproject/. It’s another way to stay up on our news and help us reach more people. Ever wonder about the person and story behind the art? We have been so pleased with the reaction to BRAVO!’s graphic design that we’d like to tell you more about its genesis. Early on, we realized the message conveyed by our posters, DVD cover, and other items should be created by a professional. We knew we had exceptional elements, but didn’t quite know how to put them together in a way that would impart the heart and soul of these Bravo Company men and their story. It started with Betty and BRAVO! friend Sheila Robertson visiting the Boise indie theater, The Flicks, and meeting with owner Carole Skinner. Carole took the time to show us many of the posters she keeps on hand, from the old classics to present-day films. From that experience, we knew we preferred a deep, rich, blue background. Sheila suggested using the Marine Corps dress blues…perfect! We also knew we had a one-of-a-kind photo, provided by Mike McCauley. The faces you see are Steve Wiese’s actual Bravo Company squad. Steve Wiese is on the far right, and Mike McCauley on the far left. Both Steve and Mike are in the film; some of the other fellows, a few of whom are mentioned in BRAVO!, were killed at Khe Sanh. With concept and photo in mind, we then turned to our friend and Idaho photographer Mike Shipman, http://www.mikeshipman.com/#!/index. Mike took our ideas and added his own to produce the final piece. 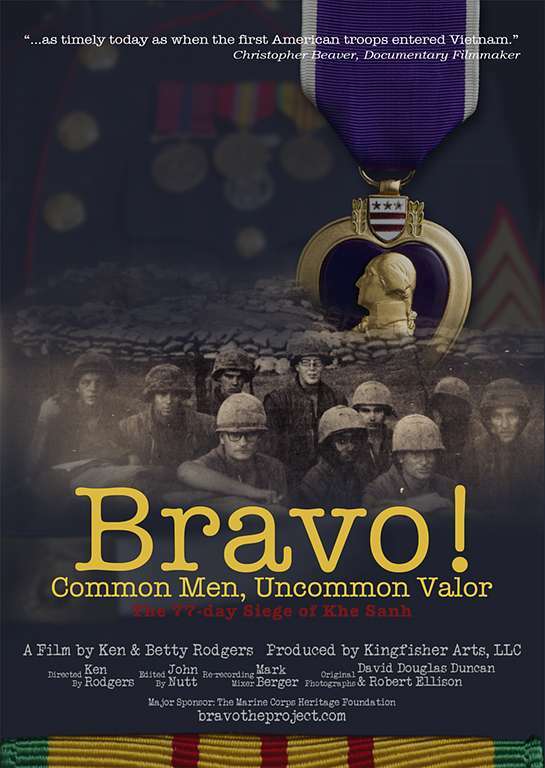 He photographed Gary Sullivan’s Marine Corps dress blues to use as the background, and Ken’s Purple Heart medal and Vietnam service ribbon for the other elements in the composition. Mike photographed Gary Sullivan in his dress blues at Gary’s place of business, Quinn’s Restaurant and Lounge in Boise. 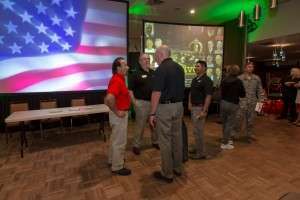 (Quinn’s is well known for its lively USMC Birthday Party every year on November 10.) The other elements were photographed and composited at Mike’s home studio in Nampa, Idaho. We couldn’t have been more pleased with the end result. Once again, as has happened since the beginning, we put a collaborative effort into the hands of a true professional, and it paid off. A full-time photographer with a degree in wildlife biology, Mike Shipman has made a big impact in the photography world here in Idaho and beyond. 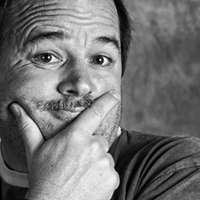 His work is commissioned by a fascinating variety of businesses, he travels around the globe to places like Zanzibar and Uruguay to photograph and experience the culture, and he teaches workshops around the U.S. from Maine to San Francisco and locally here in the Boise area. He lists his workshop services at http://www.blueplanetphoto.com/#axzz2qKfGp5g4. Ken and Betty participated in a special workshop with Mike this last May. We traipsed up to the south fork of the Payette River and learned about long exposures. Standing alongside the flowing river, Mike taught us to relax, to settle into the environment and begin looking at detail. “What subject draws your eye? What is it about the subject that draws your eye? What detail can you single out to photograph?” We began to see the way the water slipped around and over individual rocks and boulders, we saw how the color changed, and we saw textures and patterns. Then Mike taught us about composition and balancing “film” speed, shutter speed and lens openings to capture what we observed and felt. It was a remarkable day. Mike is also an accomplished writer, as you will note on his website and newsletter. We were honored to feature his Bravo! blog in 2012 at this link: https://bravotheproject.com/2012/05/07/bravo-2/. We were fortunate to meet Mike when we first moved to Boise, and have benefitted from his teaching, mentoring, and friendship ever since. We are very proud that he is a significant player in the BRAVO! you see today. DVDs of BRAVO! are now for sale with a limited-time special offer at http://bit.ly/18Pgxe5. BRAVO! has a page on Facebook. Please “like” us and “share” the page at https://www.facebook.com/Bravotheproject/. It’s another way we can spread the word. In today’s guest blog, photographer and artist Mike Shipman muses on his memories of the 1960s and the Vietnam War era. Mike is the graphic designer for Bravo! Common Men, Uncommon Valor. I’ve never been involved in a war. I’ve never been in an extremely violent situation. My life has never hung in the balance for extended periods of time. I’ve never been directly responsible for the lives of others – saving or extinguishing. My life is not that much different from the majority of Americans nowadays. I do know war. My father and uncles were involved in Vietnam and Korea in various ways. My dad’s brother, a member of Mike Company, 3rd Battalion, 9th Marines, was at Khe Sanh in 1966 for about a week and says in an email “Went out to the Rock Pile for a couple of days. Nothing much going on when we were there. Some sniper fire, but not enough to be interesting.” All survived. They came back alive, at least. Perhaps they would prefer not to have had that experience but even then are satisfied with their individual contribution. Some of them came back perhaps stronger, with more purpose than when they shipped out. All came back forever changed. I was five years old in 1968. I had a vague concept of war then. Mostly, it was a time when my dad was away. When I was a little older, I understood that some dads didn’t come back. My dad was in Vietnam in 1966 and 1969 in a non-combat role as a photo interpreter. That’s all I know and about all he can tell me. I’m fine with that. I don’t need to know everything that goes on in war. I’m sure even my wildest imaginings can’t compare with the reality. One of my earliest memories is from his first tour. My dad was stationed at Beale AFB in northern California. Uncles and friends would come by our house on base for dinner before leaving and come by again when they got back. I was exposed to some exotic meals like wat, an Ethiopian stew made with beef and onions and hotly spiced with berbere, which I knew as “berry-berry”. Wat (What? That was the big joke) was ‘berry-berry” good and the man who introduced it to me and our family was a friend named Rambo. I remember him being a husky guy, kind of Marlboro Man-like, but shorter. I don’t know if that’s an accurate description, but it’s how I remember him. The main thing about him eating wat at our house was the amount of spice he put on his plate and the amount of sweat that poured off his face as he ate. My brother and I would marvel at the sweat and laugh at the sometimes apparent distress he went through as he ate. He came for dinner one time and after that I didn’t see him again. I don’t know whatever happened to him and, although I’ve thought about it many times, haven’t eaten wat since. I remember at Beale the “morning roar” of B-52’s (and maybe an SR-71 or two), a thunderous noise as the bombers fired up their engines, just warming up and/or taking off. I don’t remember seeing B-52’s in the air, maybe because we were far enough from the flight line that we couldn’t see them. But the noise, every morning (seemed like, anyway), I will never forget. I captured a giant bullfrog at the corner of our house and took it to school for show-and-tell. Yes, of course it escaped. I remember riding on my dad’s shoulders trying to grip his gel-coated crew cut in my hands and getting a stern warning from my parents after drinking water from a stream during a camping trip. Something about things in the water that could make me sick or kill me. I remember not being too worried. The water tasted fine. I picked out a puppy, a cocker-dachshund mix, and named her Coco after a cartoon clown on a TV show (Koko the Clown, created by Max Fleisher and produced by Hal Seeger). I was born in Kansas and we moved back there in 1968 for my father’s second tour in Vietnam. I remember the house was a little square white box on a street lined with big trees. There were blue shutters on the windows. My Uncle Marvin (my mom’s brother) was visiting while my dad was away. During a typical heavy and loud Kansas thunderstorm, I must have been scared or nervous though I don’t remember feeling that way. My parents tell me it was my brother who was terrified. He’s three years younger than me and it was the first time he’d experienced such a storm. They can be quite intimidating. My brother and I were standing in the doorway, looking out onto the street. Uncle Marvin knelt next to me and told us that God had a big table with a sack of potatoes on it. Thunder was that sack tipping over and those potatoes rolling off onto the floor. Another dish that became more of a regular meal at our house was ponset (I remember pronouncing it “ponsoot”), which I associated with Vietnam even though I think its origin is from the Philippines. It’s a simple rice noodle dish made with chicken and garlic. I don’t remember if it’s a dish my dad brought back with him or if my mom learned it from someone else in our military community. We ate this dish often as I was growing up, even after my dad returned home. I haven’t had ponset since those days, either. At least as we made it. Many Pad Thai dishes resemble ponset, so I suppose I’ve been eating variations of it for a while. The Vietnam War went on for a few years after 1968, but I don’t remember much about that. We had moved to southern California and March AFB and I was busy trying to figure out if I was a Hippy or not and trying to convince my Dad to let our friend, who was an excellent airbrush artist (and a kind of Hippy), paint flames on our Datsun pickup. He eventually did. In 1969, I sat alone in front of the television one night and watched a man walk on the moon, as it happened, while my parents and some friends grilled hamburgers in the backyard. I took up playing the cello at school because I was apparently not old enough to play violin. My brother and I caught lizards in our backyard, when their tails didn’t break off and allow them to get away, threw pomegranates and snails against our back fence, and jumped our “custom” single-speed bikes, with ten-speed bike saddles, no fenders, and fat, nobby tires, over dirt mounds in an empty lot at the end of our street. We were excited to get our Time Life series of books on the world, science, nature, cowboys and Indians as well as the World Book Encyclopedia. Many hours were spent leafing through the pages of those books. Our family watched Gilligan’s Isle, the Brady Bunch, Sonny & Cher, Laugh-In, the Carol Burnett Show, I Dream of Jeannie, the Carpenters, The Smothers Brothers, and Bob Hope on television. We went to Ontario Motor Speedway to watch Al Unser, A.J. Foyt, and others race around the track, and to see Evel Knievel jump 19 cars with his motorcycle. We went to Disneyland and I cried most of the time because I didn’t want to be shrunk on the World of Tomorrow’s People Mover ride where as you waited in the lobby to get on the ride, people got on the ride at one end in Tilt-A-Whirl type cars (only they didn’t spin around). Openings in the wall showed the full-size cars going by, then smaller model cars and people on another level, then a clear tube with cars about a foot tall leading into a box which emptied into a large, clear sphere where little specks flew around randomly, hinting at what was to come. Such were the concerns of at least one little boy in the 1960s. I led a pretty regular, “normal” life for a kid, even though my dad was in the Air Force during a time of war. We moved around a lot, mostly in the west and Midwest. We didn’t go overseas. Getting to know the “new kids” usually started with a rock fight, though there really was probably only one. I don’t remember seeing much about the Vietnam War on television or encountering any anti-war protests. I wonder if that’s just me forgetting or if my parents made an effort to keep that kind of stuff away from me. My memories of that time are hit and miss, really. I was young, and I think most memories from that age period tend to fade easier than those made later in life. Though I wasn’t interested in a military life (I thought I had enough of that in our own family), I respect those who do choose it. It’s easy to distance ourselves from the events that take place during war because it’s an experience incomprehensible by those who haven’t been there – the hardships, pain, stress, instantaneous decisions that alter the course of a person’s life, the things you wish you could take back as well as the things you’re extremely proud of being a part of, the lifelong friendships forged. The only way we can get a sense of what it means to go to war, to be on the ground fighting for your life and the lives of others, is to hear it from the individuals who were there. 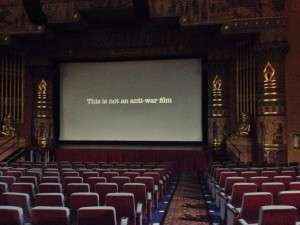 I don’t think it’s a fascination with war that drives people to want to hear “war stories” because, while we might initially be entertained by a Hollywood notion of heroes and noble battles and a glorious storytelling, we’re quickly sobered by the reality of it as told by someone we know, who we can see and touch. Someone who was there. I think the desire to know these stories is the desire and need to try and comprehend the enormity of war, the power and breadth of it, the utility and futility of it, and to understand – even a little bit – how war comes to infuse itself on a person’s soul. When I watched the film Bravo! Common Men, Uncommon Valor, I heard in the voices and saw on the faces of the soldiers in their retelling, so many years later, a complex range of emotion: sadness for the necessity to participate in conflict, anger because they did not want to be there to do what they needed to do, resoluteness because they did do what needed to be done, disbelief and amazement in what they saw and experienced, a sense of duty to make a difference, and profound grief and respect for those who didn’t make it back. I deeply respect those who choose to serve in the armed forces. My involvement in this project, though on the periphery, is in some small way honoring all soldiers for their courage then, and specifically now to the members of Bravo Company for their retelling of their stories which is helping America and the world understand more fully the ramifications of war and the truth of it, good or bad. Mike Shipman is an Air Force brat who grew up mostly in the west and Midwest, shuffled from school to school, rock fight to rock fight, until high school when his father, too, had had enough. He started out with a career as a wildlife biologist and now is a freelance photographer and photography instructor living in Idaho. Mike met Betty several years ago when she was a student in one of his photography classes.